For today’s Destination of the Week, we are going to a semi-autonomous city known for its glittering skyline and beautiful harbor. Connecting both Eastern and Western cultures, this former British colony is home to exquisite cuisine and incredible shopping amidst a landscape of modern skyscrapers and historical temples. We’re hea ding to Hong Kong! A view of Hong Kong from Victoria Peak. Once a sleepy fishing port with farms scattered along coastal villages, Hong Kong became a British colony in 1842, with the founding of Victoria City the following year. However, following a wave of deadly floods, typhoons and famine in mainland China, along with the Taiping Rebellion, many Chinese emigrated to the quiet refuge. The growth of the port boosted both the Asian and Western populations, and in 1898, Britain obtained a 99-year lease of Lantau Island and the adjacent northern lands, which became known as the New Territories. The flag of the British colony of Hong Kong, c. 1959. World War II hit Hong Kong hard with a Japanese occupation that brought food shortages and widespread unemployment that drastically reduced the population until Britain seized control again in 1945. Since then, the territory prospered as an industrial and commercial hub, with its economy transitioning from manufacturing to services and finance. 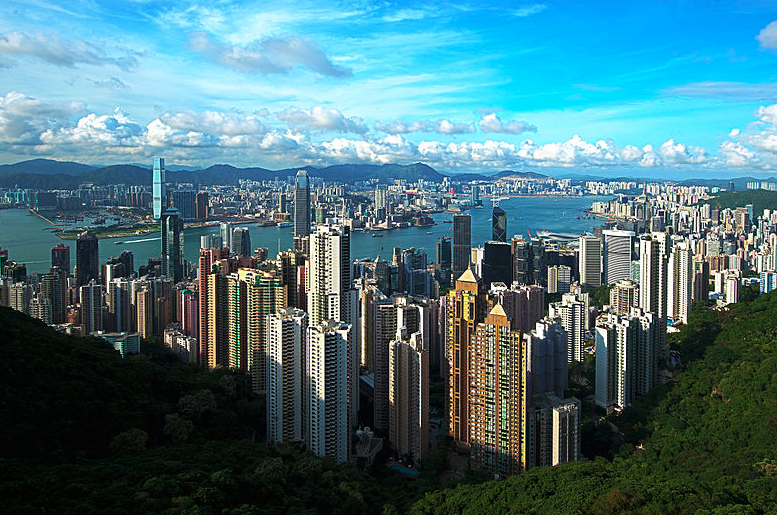 Hong Kong is currently the home of many large banking corporations as well as the world’s busiest deepwater port. In 1997, Britain’s lease was up and Hong Kong officially became a special administrative region of China, governed under the principle of “one country, two systems,” by which China agreed to give the region a high degree of autonomy and to preserve its economic and social systems for 50 years from the date of the handover. Hong Kong has its own constitution called the Basic Law, as well as its own currency (the Hong Kong dollar) and customs status. However, if it so deems, the government in Beijing can veto changes to the political system, and China still controls foreign and defense policies. Hong Kong has a rich cultural heritage, and a perfect place to start exploring and escape the busy streets is the Man Mo Temple, which dates back to 1847 and is a tribute to the Gods of Literature and War. Part of a complex that comprises of three adjacent blocks – Man Mo Temple, Lit Shing Temple (No. 128 Hollywood Road) and Kung So – the main temple building is dedicated to the civil god Man Cheong and the martial god Kwan Tai. The Temple was officially entrusted to Tung Wah Hospital with the enactment of the Man Mo Temple Ordinance in 1908, but even nowadays, the Directors of the Tung Wah Group of Hospitals and community celebrities still congregate there each year at the Autumn Sacrificial Rites to pay homage to the gods. 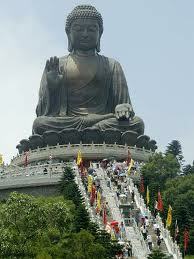 Visit the Big Buddha and Po Lin Monastery for some Zen. To really get into a zen-like state, visit one of the most important Buddhism centers in the south of China, the Po Lin Monastery and Giant Buddha, located on Lantau Island. The monastery was built in 1906 by three monks from Jiangsu, while the Buddha was completed in 1993 after 12 years of design and construction. Access to the Buddha is free of charge, but if you would like to go inside there is a small fee. Be warned, to get to the giant statue there is a 268-step climb – but it is worth it just for the sweeping mountain and sea views from the base. 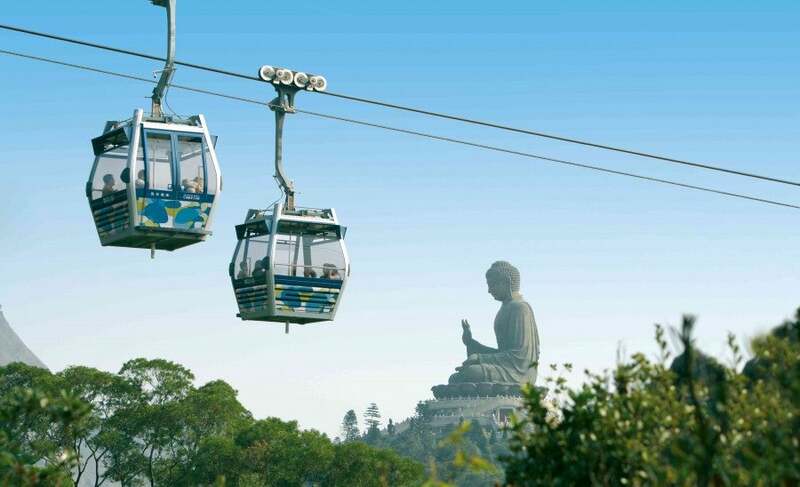 Take a ride over to the Buddha in the Ngong Ping Gondola. You can access the Po Lin Monastery by using the Ngong Ping 360 which is a gondola/cable car that goes over the harbor. This is a tourist attraction in itself, with beautiful views of the Hong Kong International Airport, verdant, mountainous terrain of Lantau Island, Tian Tan Buddha and the 360-degree view of the Ngong Ping Plateau on the 25-minute ride. 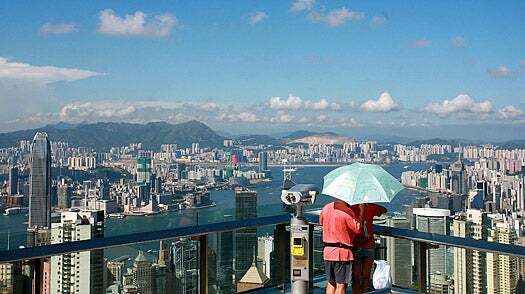 Take a ride on the Peak Tram to see some amazing views at Victoria Peak. Another mode of transport that is considered a tourist attraction is the historical Peak Tram, a cool funicular railway that will take you from the heart of the city up to the island’s famous landmark, Victoria Peak. You can experience beautiful views of the city and well, let’s just admit it, everybody love trains, kids and adults alike. See the Symphony of Lights Show while cruising on the Star Ferry. Hong Kong is not just a big city, it’s actually an archipelago made up of 260 islands. Therefore, a ferry trip on Star Ferry around the harbor makes for an interesting and inexpensive way to explore the harbor from the water. The views of Hong Kong are stunning, not to mention maybe you will catch the Symphony of Lights show if you ride in the evening. Named the “World’s Largest Permanent Light and Sound Show” by Guinness World Records, the light and laser beam spectacular is divided into five themes: Awakening, Energy, Heritage, Partnership, and the finale, Celebration. 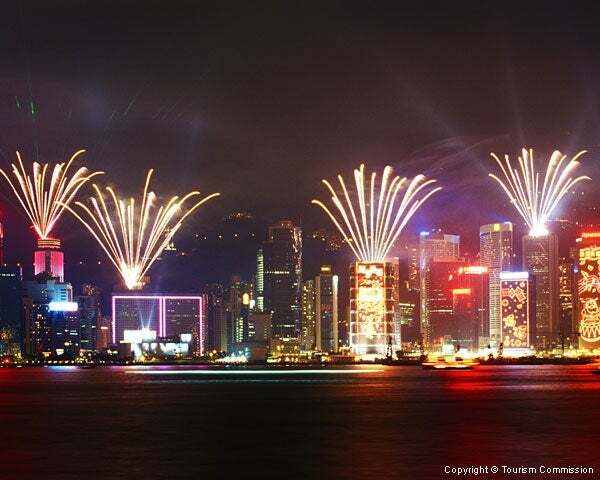 Shows are on nightly along along the Tsim Sha Tsui waterfront between the Avenue of Stars and the Hong Kong Cultural Centre, and Discover Hong Kong has tips on the best vantage points to get the ultimate experience. Enjoy shopping and street food at the Temple Street Night Market. 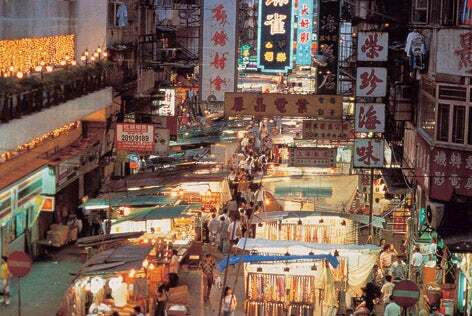 Hong Kong is just as busy after dark, and for a unique evening experience, check out the Temple Street Night Market. If you are searching for cheap clothes, souvenirs, or pretty much anything, you can find it at this popular street bazaar. There are open air food stalls serving local delights such as claypot rice, noodles or seafood – and it is really worth just going for the local atmosphere, even if you don’t actually want to purchase anything! Pacific Place has high-end shops like Louis Vuitton. Shopping is practically a sport in Hong Kong and people take it very seriously. For mid-range products, try the Causeway Bay shopping area, where the rent was ranked as the world’s most expensive for the second year in a row in 2012 – surpassing New York’s Fifth Avenue. The countless malls include the Windsor House, Hang Lung Centre, Fashion Island, Fashion Walk, and the World Trade Centre, and many shops are open after midnight. If high-end shopping is what you are looking for, head to Pacific Place or south of Hollywood in Soho. In Central, the Atrium shops, which connect several of the city’s best known skyscrapers and hotel towers, has all the big names. Over on Kowloon, well-heeled fashionistas hit the shops at Harbour City, Ocean Terminal, and the beautiful new shopping and entertainment complex at the towering International Commerce Centre building called Elements. 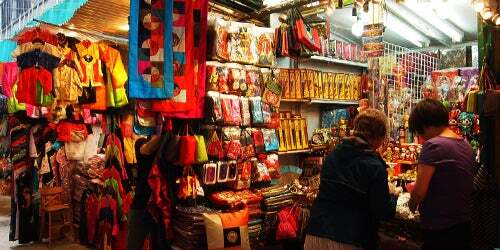 Shop the stalls along Li Yuen. On Li Yuen Street, you can find cheaper goods in a bustling flea market environment despite its location in the center of the business district. Sometimes known as “the lanes of Central,” Li Yuen Street East and Li Yuen Street West are both vibrant and colorful hubs full of bartering buyers and vendors. Hong Kong has no shortage of restaurants – eating is a major pastime here, and it shows in everything from humble streetside noodle shops to three-Michelin-Star restaurants (the city has five of them!). Dig in at Spoon in the Intercontinental hotel. Located in the Intercontinental, Spoon is a two-Michelin-star restaurant by Alain Ducasse. This high-end restaurant featuresdecor by Tony Chi – there are actually spoons on the ceiling! – and it prides itself on offering the best of both French and Asian cuisine with stunning Harbour views. To taste a sample of everything, opt for the Spoon Experience Menu. Spice up your life at Chili Fangara. Chili Fangara is a warm and inviting restaurant with one Michelin star that features traditional Szechuan cuisine, with a fiery flair, of course. Give one of their specials a shot, like the Chili Jumbo Prawns or the Mandarin Fish with Gnoki Mushrooms. This restaurant is known for intense flavors and spicy kicks, but they also have softer, smoother dishes for the less daring. Have Dim Sum at Island Tang. Of course you can’t come to Hong Kong and not try some traditional dim sum, so head to Island Tang for “Cantonese and Chinese Haute Cuisine” in the restaurant that was decorated by Sir David Tang with elements of understated luxury. 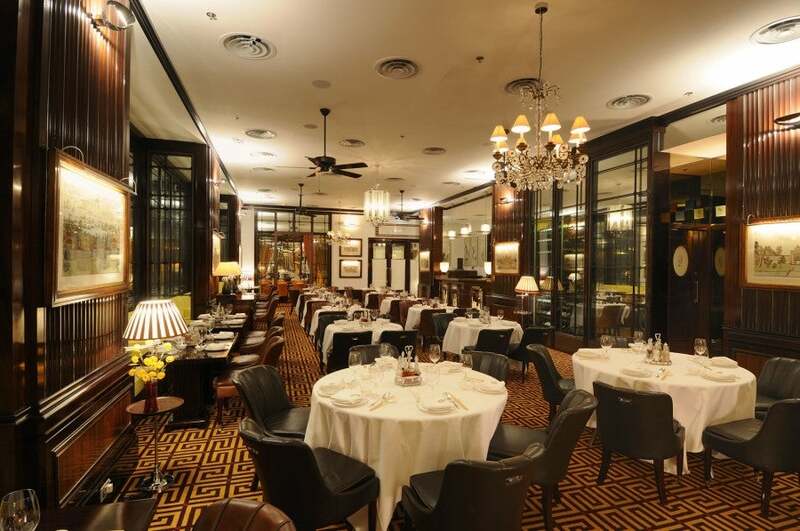 Order the classic Peking Duck or the Crispy Wagyu Beef Cheek, and taste the vintage wine selection. The Island Tang staff takes customer service very seriously and it is quick and efficient. 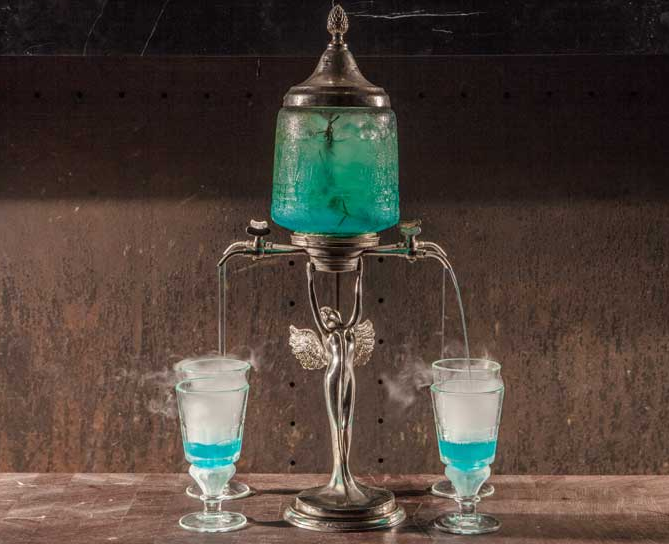 The Blue Butcher is known for its artistic cocktails. Hollywood Road – once a bastion of out-of-the-way antiques shops where more than a few treasures lay hidden – has become a hip new place to grab a bite in the evening thanks to restaurants like the New York-inspired restaurant and bar, The Blue Butcher, which has been dubbed one of the coolest spots in Hong Kong, with the fun party scene downstairs contrasting with the open-concept kitchen upstairs. Across the street, Three Monkeys is a cozy hipster hangout serving Japanese-style robata skewers and artisanal cocktails. Over on the Bonham Strand, Noodlemi Sheung Wan captures the Vietnamese noodle bar concept with steaming Pho and French-influenced baguettes. 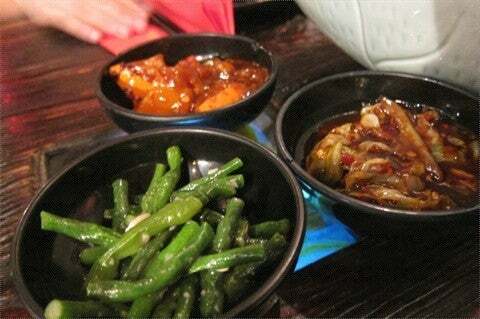 All the dishes are MSG and gluten-free and served in a casual setting. For a standard of Cantonese cuisine, locals and tourists alike head to one of the locations of Lei Garden, where the food won’t disappoint (even if it might not always impress). For a higher-end version, try the Shangri-La’s signature Shang Palace Cantonese restaurant, which has two Michelin stars and where a simple Chinese meal turns into a feast fit for an emperor. There are far too many restaurants to mention, but if you have favorites of your own please mention them in the comments below! Hong Kong’s Terminal 1 is third largest airport passenger terminal building in the world. 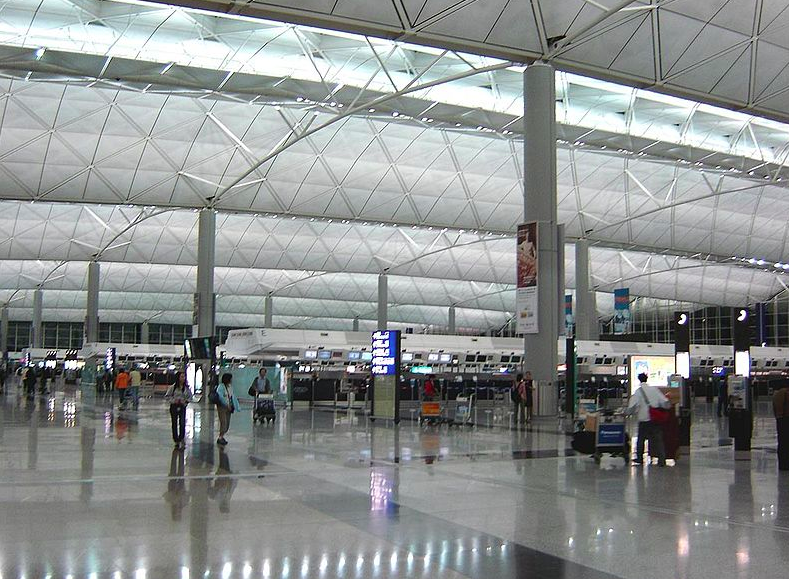 The Hong Kong International Airport (HKG) is located on the island of Chek Lap Kok and has been operating commercially since 1998. It is considered to be the 12th busiest airport in the world and approximately 90 airlines fly in and out of it. There are non-stop flights to Hong Kong from several airports in North America including Los Angeles, San Francisco and Vancouver on the West coast; Chicago, and New York, Newark and Toronto on the East coast. If you want to fly Hong Kong’s flagship carrier, Cathay Pacific, you can use your American AAdvantage or British Airways Avios miles to to do. To fly one way from North America to Hong Kong on Cathay Pacific using Advantage miles, it requires 35,000 miles for economy class, 55,000 for business and 67,500 for first class. To fly one way nonstop from LAX to HKG on Cathay Pacific using British Avios miles, you’ll need 35,000 Avios for economy, 52,500 for economy comfort, 70,000 for business and 105,000 for first class each way. From other major cities in Asia, such as Tokyo or Shanghai, there are a variety of options you can fly to get to Hong Kong, such as China Eastern (SkyTeam), Dragon Air (which is a member of Oneworld since it’s part of Cathay Pacific) and Hong Kong Air, or you could transit through Tokyo via ANA (Star Alliance) or JAL (Oneworld), or Seoul on Korean Air (SkyTeam) or Asiana (Star Alliance). From the Hong Kong Airport, you can get the Airport Express trains to the city center, which takes about 20-24 minutes depending on your destination station. Tickets cost between $14-$23 roundtrip, depending on which train station you would like to end at. Another inexpensive option is the various city buses that will take you to several destinations within Hong Kong. There are color-coded taxis – red for Hong Kong destinations, green for New Territories, and Blue for Lantau. Taxis can cost anywhere from $20-$75 depending on your destination and take about 30-40 minutes to get to the city center. The Conrad Hilton Hong Kong. 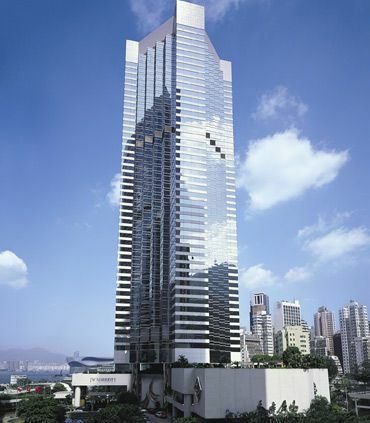 Conrad Hong Kong: This deluxe hotel has 512 rooms on 61 floors located in Hong Kong’s vibrant business district. Rooms feature a flatscreen TV, a Nespresso machine, marble bathrooms, an alarm clock radio, blackout curtains and designer bath products. WiFi is complimentary throughout the hotel and in guestrooms if you are an HHonors Gold or Diamond Member, if not it costs $5 per day. The hotel also has a heated outdoor swimming pool, sauna, steam room and a 24-hour fitness center. In-room massages are available. The hotel is located above a large shopping center, Pacific Place, containing an AMC Cinema, designer shops such as Prada and Versace, and several restaurants. The numerous dining options include Nicolini’s Garden Cafe, Brasserie on the 8th, Pacific Bar, Golden Leaf and the Lobby Lounge. Room rates start at 3,500 HKD ($450) per night in January. This is a Category 9 hotel requiring 80,000 HHonors points for an award night. 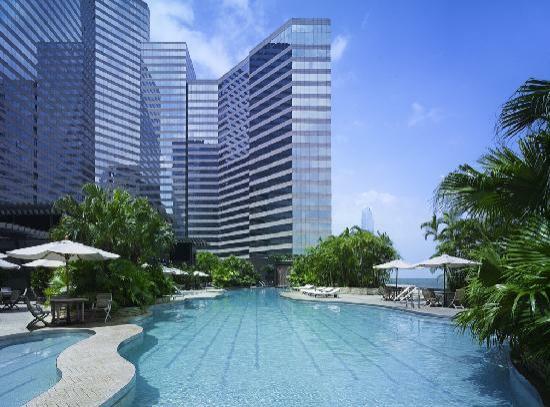 Relax in the pool at the Grand Hyatt Hong Kong. 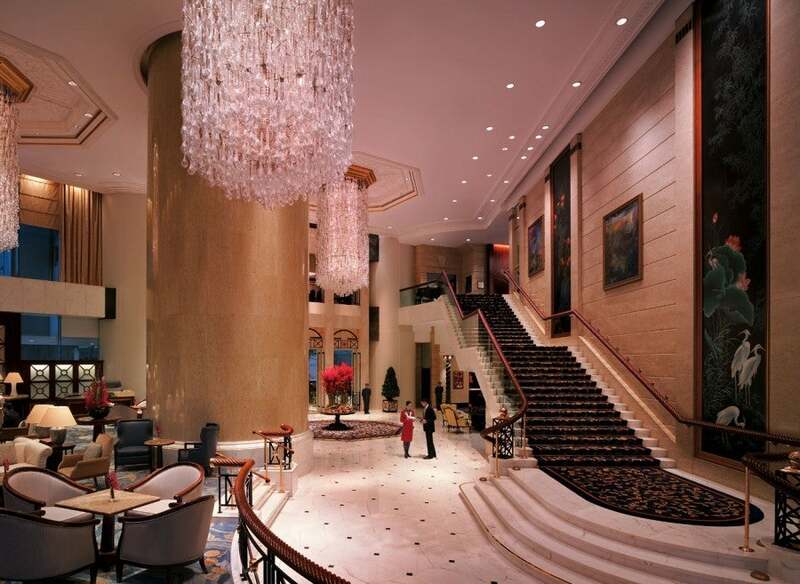 Grand Hyatt Hong Kong: Located next to the Victoria Harbour, this hotel has 549 guest rooms and suites. WiFi is complimentary for guests and rooms feature a flatscreen TV, marble bathrooms, coffee maker, bath amenities by June Jacobs, and an oversized work desk. There is a 24 hour fitness center, a heated outdoor pool and a 400-meter jogging track, or for a little pampering, visit the Plateau Spa. You have several options for dining, as this hotel features nine restaurants. Room rates start at 3,800 HKD ($490) per night in January. This is a Category 6 hotel requiring 22,000 Hyatt Gold Passport points for an award night. 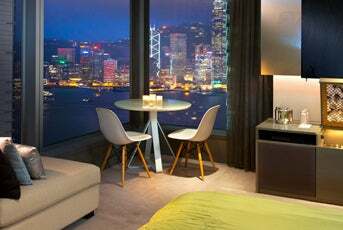 Another Hyatt option in Hong Kong is the Hyatt Regency Tsim Sha Tsui. The Presidential Suite at the Intercontinental Hong Kong has a private jacuzzi. Intercontinental Hong Kong: Located on a prime spot on the Kowloon waterfront, this hotel’s 583 guestrooms and 87 suites all have a flatscreen TV, WiFi for a fee of 156 HKD or $21 per day (but it is complimentary for Elite IHG Rewards Club members) a work desk with lamp, stereo, and DVD player. The renowned Presidential Suite features a private jacuzzi overlooking the Harbour. There is a 24-hour fitness center, a large outdoor pool with prime Harbour views, and a small I-Spa designed according to the tenets of feng shui. Dining options include Nobu Hong Kong, Spoon (see details above) by Alain Ducasse, Yan Toh Heen for Chinese specialties, the Steakhouse Wine Bar, Harbourside, and the Lobby Lounge. Room rates start at 3,392 HKD ($437) per night in January. This is a Category 8 hotel requiring 45,000 IHG Reward points for an award night. Asian-themed guestroom decor at the Hotel Indigo Hong Kong. 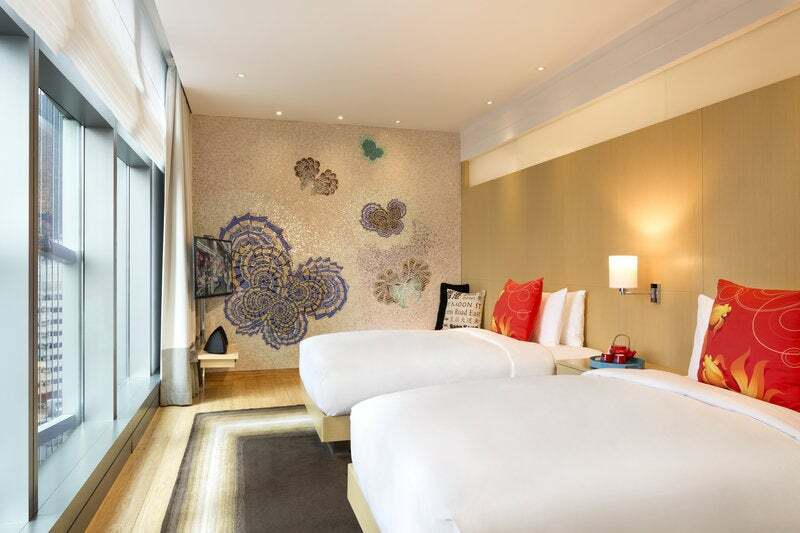 Hotel Indigo: Situated in the Wan Chai neighborhood, this hotel is close to several tourist destinations, shopping and entertainment. WiFi is complimentary for all guests and hotel rooms feature a flatscreen TV, coffee maker, DVD player, stereo and free local phone calls. There is a fitness center and an outdoor rooftop infinity pool. Dine at Cafe Post or the rooftop restaurant, Skybar. Room rates start at 1,870 HKD ($241) per night in January. This is a Category 8 hotel requiring 45,000 IHG Reward points for an award night. Other IHG properties in Hong Kong include the Crowne Plaza Causeway Bay, Crowne Plaza Hong Kong Kowloon East, Holiday Inn Causeway Bay, Holiday Inn Express Hong Kong Soho, Holiday Inn Golden Mile, Holiday Inn Hong Kong Kowloon East, and the Intercontinental Grand Stanford. A treatment room at the Ritz Carlton Hong Kong Spa by Espa. 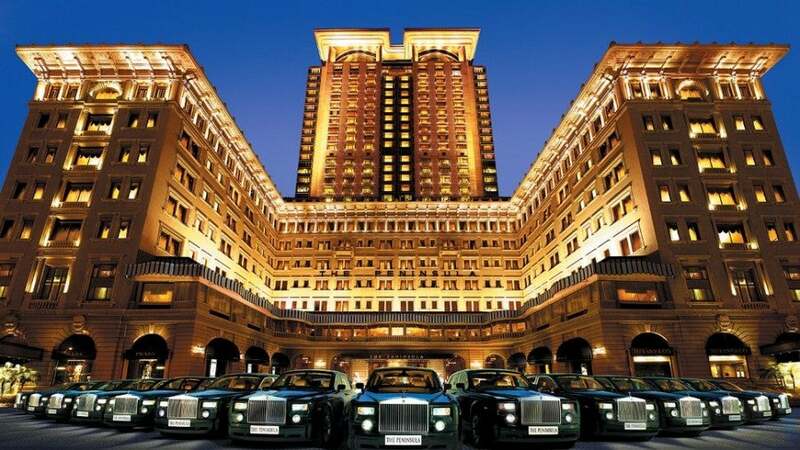 Ritz Carlton Hong Kong: This 490-meter high hotel dominates the Hong Kong city skyline. It has 312 guestrooms and suites, all equipped with complimentary WiFi, 600 threadcount bed linens, down pillows, two flatscreen TVs (one in the bedroom and a smaller 17-inch in the marble bathroom), and a Nespresso coffee machine. The lobby is on the 103rd floor of the International Commerce Centre tower, and rooms range up to the 117th floor. Guests can enjoy treatments and traditional Asian healing remedies at the spa by ESPA. The hotel also has a fitness center and swimming pool. You can dine at one of six restaurants: Tin Lung Heen (two Michelin stars), OZONE (the highest bar in the world), Tosca, Cafe 103, The Lounge and Bar, and Pastry Gems. Room Rates start at 4,600 HKD ($593) per night in January. This is a Category 5 hotel requiring 70,000 points for an award night. The high-rise JW Marriott Hong Kong. JW Marriott Hong Kong: Situated just down the street from the US Consulate in Hong Kong, this JW Marriott has 577 guestrooms and 25 suites. Rooms feature complimentary WiFi, a flatscreen TV, Bose sound system, alarm clock, down pillows and comforters, and a coffee maker. The hotel offers in-room massages, and has a pool and fitness center. Pets are not allowed. You can dine at any of the nine restaurants on-site, ranging from a deli to a wine bar or traditional Asian cuisine. Room rates start at 2,890 HKD ($373) per night in January. This is a Category 8 hotel requiring 40,000 points for an award night. 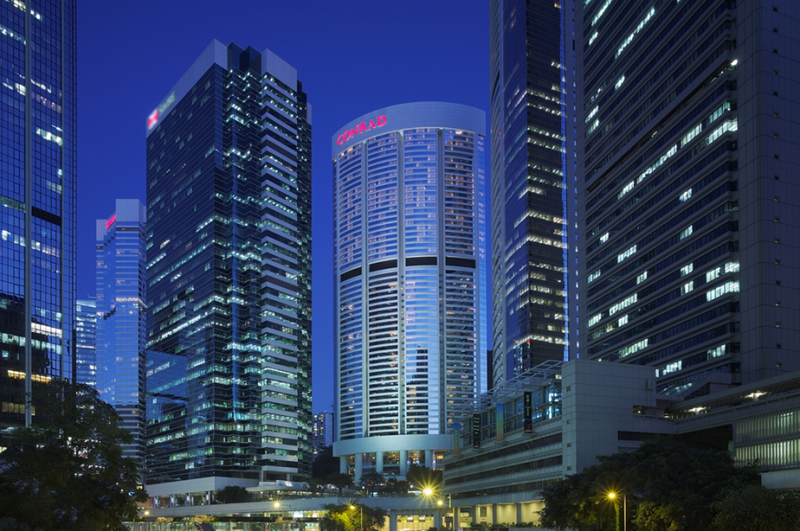 Other Marriott options in Hong Kong are the Courtyard Marriott Hong Kong, Countyard Marriot Sha Tin, Renassiance Hong Kong Harbour, and the Sky City Marriott Hong Kong Airport. A Cool Corner room at the W Hong Kong. 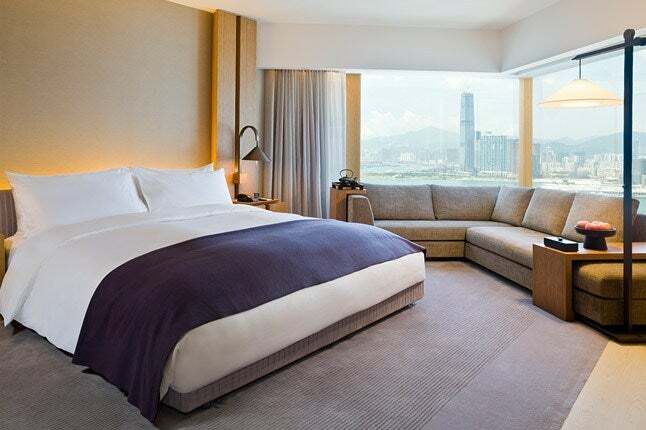 W Hong Kong: This hotel comes TPG-recommended (read the review of the Cool Corner Room here), and its 393 rooms/suites each has a skyline view, as well as an iPod docking station, alarm clock, Bliss Amenities and a Munchie box in case you get hungry. WiFi in all guest rooms costs about $15 per day. Visit the FIT gym, the WET outdoor pool or the very first Bliss Spa in Asia. You can also shop in the W store for travel accessories and other nifty gadgets. 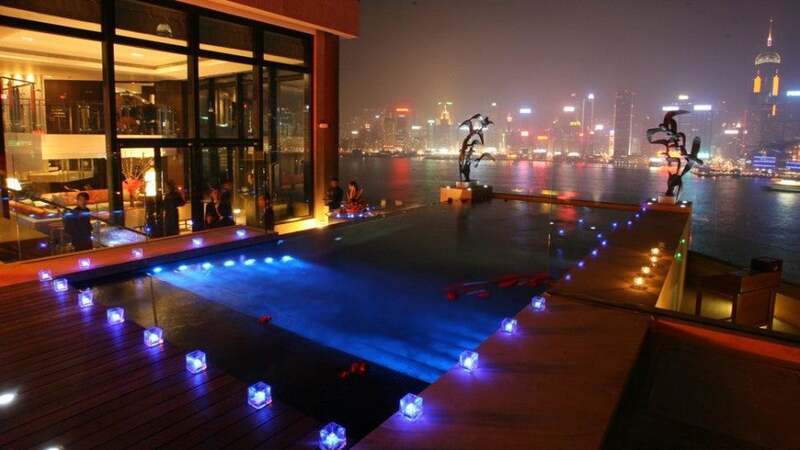 Restaurants include Woobar, WET Deck, Kitchen, and Sing Yin Cantonese Dining. Room rates start at 2,700 HKD ($348) per night in January. This is a Category 6 hotel requiring 20,000 Starpoints for an award night. 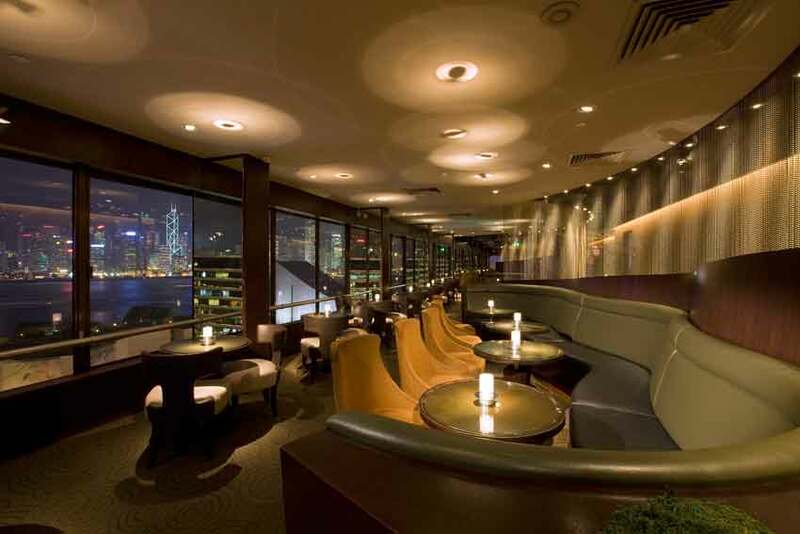 Have drinks and dinner at the Sky Lounge at the Sheraton Hong Kong. Sheraton Hong Kong: Located at the top of Kowloon’s Gold Mile, each of the 782 guestrooms and suites comes with the Sheraton Sweet Sleeper Bed, an iPod docking station, coffee maker, and safe, but WiFi costs about $15 per day. You can workout at the fitness center, swim in the outdoor pool, or enjoy executive access and services if you pay extra for the Tower level. Basic spa service are also available. You can dine at the Lobby Lounge, Sky Lounge, Oyster and Wine Bar, Unkai Japanese Cuisine, the Cafe, or the Celestial Court Chinese restaurant. Room rates start at 2,100 HKD ($270) per night in January. This is a Category 5 hotel requiring 16,000 Starpoints for an award night. Other Starwood properties in Hong Kong are the Le Meridian Cyberport. A Harbor View room at the Four Seasons Hong Kong. 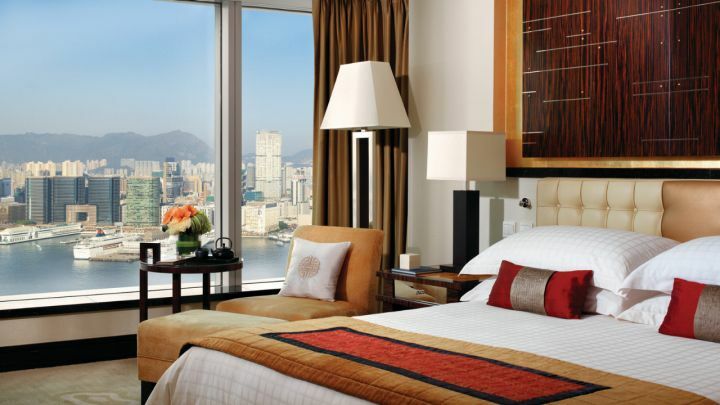 Four Seasons Hong Kong: Overlooking Victoria Harbour, this hotel has 399 guestrooms, including 54 luxury suites. Each guestroom comes with L’Occitane amenities, complimentary fruit and water, bathrobe and slippers, Nespresso machine and free WiFi for up to 3 devices. Workout in the fitness center which offers classes such as T’ai Chi, or enjoy a dip in the infinity pool. The hotel also has babysitting services available, or you can shop at the Four Seasons Boutique and get pampered at the spa. The Four Seasons Hong Kong is actually the only hotel in the world to have two 3-Michelin starred restaurants: Caprice and Lung King Heen. You can also eat at the Lounge, the Pool Terrace, Blue Bar, and Caprice Bar. Room rates start at 4,700 HKD ($606) per night in January. The lobby of the Shangri-La Hong Kong. Shangri-La Hong Kong: Linked to the Pacific Place shopping mall, the Shangri-La Hotel is comprised of 531 guestrooms and 34 suites. Each guestroom has complimentary WiFi, two flatscreen TVs, one in the bedroom and one in the bathroom, a large work desk, and safe. There is a 24 hour fitness club, indoor and outdoor jacuzzi, outdoor swimming pool, sauna and steam room, solarium and massages/facials are available. Hatha yoga classes are also offered free of charge. A flower shop, gift shop and hair salon are also located in the hotel. There are eight dining options: Island Gourmet, Summer Palace , Lobby Lounge, Lobster Bar and Grill, cafe TOO, Nadaman, Waterside Terrace, and Restaurant Petrus. Room rates start at 3,900 HKD ($502) per night in January. A spa treatment room at the Mandarin Oriental Hong Kong. Mandarin Oriental Hong Kong: Each of the 430 guestrooms and 71 suites at the Mandarin Oriental Hong Kong have been designed to reflect the chain’s Asian heritage. Each room features Hermes bath amenities, a Nespresso coffee machine, an interactive entertainment system which allows you to add your iPod or MP3, and complimentary WiFi for up to six devices. The hotel has a hair salon and a barbershop, a spa, and a large indoor pool. There are actually 10 restaurants on-site, including two-Michelin-starred Pierre French Restaurant by famed chef Pierre Gagnaire. Room rates start at 4,400 HKD ($568) per night in January, taxes not included. Other Amex Fine Hotels and Resorts in Hong Kong are the Landmark Mandarin Oriental, Peninsula, Upper House, and Intercontinental Hong Kong. The Peninsula Hotel in Hong Kong. Peninsula Hong Kong: Designed with a modern, contemporary decor, guest rooms at the Peninsula range from the Superior room to the Peninsula Suite with many options in between. All guestrooms and suites have an interactive digital bedside panel, coffee machine, a flatscreen TV, free long distance calls and WiFi, and an executive work desk. There is a fitness center, indoor pool, sundeck, sauna and steam room. 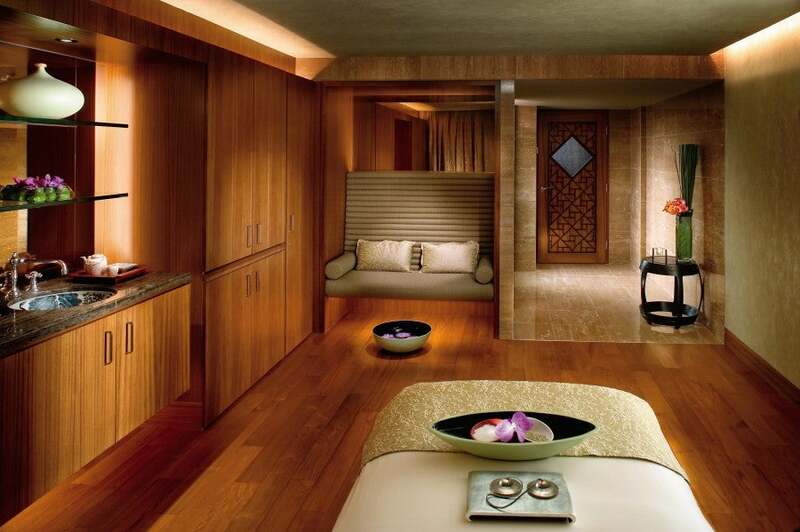 The Peninsula Spa offers both Eastern and Western treatments in one of their 14 rooms. Dine at the Verandah, the Bar, or Gaddi’s. Room rates start at 5,280 HKD ($681) for per night in January. A guestroom at the Upper House Hong Kong. Upper House Hong Kong: The designer of the Upper House, Andre Fu, is an “Asian Design Sensation” according to Conde Nast Traveler. Fu created the Upper House as a hotel but with the tranquil, comfortable feeling of a private home. Its 117 rooms and suites are all exceptionally large, and come with an iPod touch, 2.1 surround sound, a flatscreen TV, dual temperature wine fridge, espresso machine, and free drinks and snacks. WiFi is also complimentary in guestrooms and throughout the hotel. You can workout in the fitness center, take a yoga class, or use bikes free of charge during your stay. Dine at Cafe Grey Deluxe, Cafe Grey Bar, and the Sky Lounge, or relax with snacks on the Lawn. Room rates start at 4,807 HKD ($620) per night in January. Other Visa Signature Properties are the Mira Hotel, Landmark Mandarin Oriental, and the Conrad Hilton.